When it comes to logistics in the pharmaceutical industry, the two biggest factors are security and traceability. 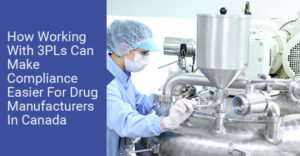 Drug manufacturers have to deal with the risk of counterfeiting, contamination and shortages during distribution, which may compromise the quality of the products. As such, it is important that manufacturers in Canada work with a logistics service provider that upholds the same standards for regulatory compliance as them. To become a reliable and effective partner in the healthcare supply chain, 3PL has been employing a number of strategies that help pharma comply with Health Canada regulations. Third party logistics providers have different shipping specialties. Those that focus on medications naturally have the scale to invest in cutting edge, specialised equipment to ensure that your medical products are compliantly handled from the loading to unloading. Wholesalers looking to handle the shipping by themselves would have to invest in validated coolers and similar materials that increase the cost of shipment. 3PL providers, on the other hand, have dedicated, refrigerated trucks that ensure consistency in the handling of the cooled products without incurring extra costs beyond normal cooling operations. Furthermore, multiple customers can take advantage of the refrigerated truck technology in a single trip to enjoy further savings through economies of scale. Smaller manufacturers typically find that outsourcing their 3PL needs is much easier and cost effective than setting up the necessary infrastructure, facilities, and processes; hiring staff to run the operations; and managing relationships with customers. However, mid-sized and larger manufacturers that have the resources to handle the different aspects of the supply chain may prefer to handle logistics in-house. Such a move is actually logical if they have the scale that increases ROI. But these manufacturers may still find that outsourcing to 3PL is not such a bad idea if they look beyond recouping their initial investment. For instance, as the manufacturer introduces new products, they will be required to also increase manpower, improve capacity and boost the capabilities of the resources, which may involve investing in refrigeration and other expensive special handling procedures. The continual investment process will also include adjusting infrastructure and technology as need be to comply with the constantly evolving support pedigree, track-and-trace, and government product integrity requirements. 3PLs that specialise in health products are committed to the continual investments needed to remain compliant with the evolving Health Canada regulations, including licensing requirements and regulations. Generally, 3PLs handling medical products have the necessary plans, resources, and processes in place to ensure that they can adhere to the constantly evolving product serialisation and pedigree regulations. This includes having quality IT infrastructure to not only ensure compliance with guidelines on electronics records, but also to quickly and efficiently provide the relevant bodies with information that validates the vendor’s chain of custody and proper product handling throughout the supply chain. When looking to commercialise a product, poor navigation of the regulatory arena can hinder its success. Fortunately, 3PLs in the health sector are familiar with regulatory issues, and are adequately equipped with industry know-how and expertise to evade the particularly troublesome ones. It is important to work with a 3PL provider who has a proven cGMP expertise; solid and long-term relationships with the regulatory agencies; and the appropriate equipment and systems to continually validate and report that your product has been compliantly handled through the entire chain of custody. When you work with a third party logistics provider, compared to working alone, you get instant access to their resources, relationships and expertise in healthcare logistics, which you can leverage to protect yourself from having to handle all the intimidating particulars of product-specific licensing necessities. As mentioned in other points above, good 3PL providers in the health industry are familiar with just about every possible scenario you may encounter in the supply chain. The providers will be available to guide you during overwhelming times, such as product recalls or peak ordering periods. They can quickly scale up the workforce to safely and efficiently handle new tasks, and even take care of otherwise daunting tasks such ensuring compliant product destruction or disposal. Many countries seem to be taking the multi-client distribution facility approach, where pharmaceutical companies consolidate their distribution. Besides the convenience and cost savings that this model offers, it also suggests that the industry is putting more trust in the ability of third party logistics providers to handle inventory distribution, regulatory compliance and other aspects of the supply chain. At a time when drug manufacturers are looking for ways to access new markets while remaining nimble, cost efficient and also compliant to the changing industry guidelines, it seems like the most rational solution is to create partnerships with highly knowledgeable and connected 3PLs, and leverage the already established networks.